The following are excerpts from an interview recently conducted with Ambassador Hazem M. Fahmy of Egypt in Seoul by The Korea Post media for publication.—Ed. Question: What are the most important major policies of your country in the New Year? Answer: In the New Year, Egypt is continuing to implement its strategy formulated in response to popular mandate after two great consecutive revolutions that took place on the 25th of January 2011 and 30 June 2013. This strategy embodies two central policy components; a domestic agenda focused on an ambitious economic reform program coupled with measures aiming at the achievement of social justice, and a reinvigorated dynamic foreign policy involving strong outreach activities and partnerships. The main policies behind the economic reform program involve the implementation of massive new, hard and soft, infrastructure projects preparing Egypt for the demands of the 21st century. This involves on the hard infrastructure side, the building new road networks, new smart cities, a new administrative capital, new economic zones, and a strong move toward acquiring all sorts of cutting edge technologies to modernize Egypt’s industries and to build new industrial capacities. On the soft side of infrastructure Egypt is upgrading its education and health services to meet the needs of its growing population on a scale that is unprecedented in its modern history. A: The most important areas of cooperation between Egypt and Korea in the New Year are; Investments, trade and education. In this regard, a large Egyptian business delegation headed by the Minister of Finance, and with the participation of the Minister of Investment and International Cooperation, is expected to visit Korea at the end of February to look into practical ways to improve Investment and trade flows, as well as educational ties between both countries. The visit is expected to involve high level meetings with senior government officials and heads of Korean economic institutions, as well as networking between business representatives on both sides. The only time an important similar gathering happened in the recent history of both nations was on the side of the visit by Egypt’s President, H.E. Abdel Fattah el-Sisi to Korea in March 2016. A: The trade balance between both our countries totals around 2.2 billion US$, with a significant surplus in favor of Korea, and it is not expected to change radically over the next 12 months. However, we are attempting to achieve some balance in the overall economic relations through various measures such as; increased Egyptian exports to the Korean economy, stimulating Korean direct investments to the Egyptian market, and attracting a large volume of Korean tourism to Egypt. Q: What are your competitive products and services attractive to Korea, and what are Korean products and services that your country might wish to import from Korea? A: Korea has a decisive advantage in high value added products embodying advanced technologies, due to its advanced stage of development, such as; cars, electronics, and durable goods, while Egypt’s competitive advantage with Korea lies in; agriculture products, raw materials and some intermediate goods. In the area of services, tourism would be the most attractive product for Koreans, and I would imagine that Education and transfer of technology would be the most important services Egypt could import from Korea in the near future. The government Ministers of Korea (on the left-hand side) and those of Egypt (on the right) take notes of the remarks of President Moon Jae-in (fourth from left) and President Abdel Fattah el-Sisi of Egypt (sixth from left). Q: What are areas in your country where you want Korean companies to invest and what are the areas where you wish businessmen to invest in Korea? A: I think this is the area where Egypt has the most to offer to Korean companies, and where its decisive competitive advantage lies, investment opportunities. Egypt is one of the most strategically situated countries in the world when it comes to trade, as it is geographically located at the crossroads between three great continents; Africa, Europe and Asia, and has one of the world’s most important waterways for global trade, the Suez Canal. This makes it an attractive investment destination. Egypt also has a population of a hundred million people and adds ten million people to its population every four years. This makes it a huge domestic market with a large middle class with many attractive investment opportunities. On top of this Egypt has a network of free trade areas with many economic entities in the world such as; the European Union, Arab States, EFTA (European Free Trade Association) countries, Marcos (South Common Market in Latin America) and Turkey. Any company that invests in Egypt has access to a market of 1.8 billion people that it can export to. In March 2018 African heads of state signed the blue print of a Pan African Free Trade Area that will encompass all 54 African States within a few years when it comes into full effect. This means that any company that invests in any African country will have access to the entire African Market without any customs or duties. Egypt, besides its strategic location, has one of the best infrastructure facilities in Africa and could be the hub for any Korean investments targeting African Markets. As Africa is the Emerging market of the world and has the fastest rates of growth among its economies worldwide, now is the time for Korean companies to take advantage of the upcoming African Continental Free Trade Area and consider to relocate in Africa, and particularly in Egypt. Finally, as mentioned earlier Egypt is implementing a very ambitious economic reform program that involves mega infrastructure projects that could be attractive business opportunities for Korean companies to work in and to invest as well. Prominent among those mega projects is the Suez Canal Economic Zone. It is a special economic zone around the Suez Canal waterway and is multiple times the size of Hong Kong, but with a far better strategic location. This area is intended to be a global hub for many industries, logistical services, and transit trade between major global markets. Hence, it presents a unique business opportunity for Korean companies with a vision for the future. A: Honorable member of the Korean National Assembly, Mr. Won Shik Woo, heads the Korea-Egypt Friendship Association at the Korean Parliament. Honorable Won Shik Woo was until recently the speaker of the ruling party in the Korean National Assembly and is a great friend of Egypt. 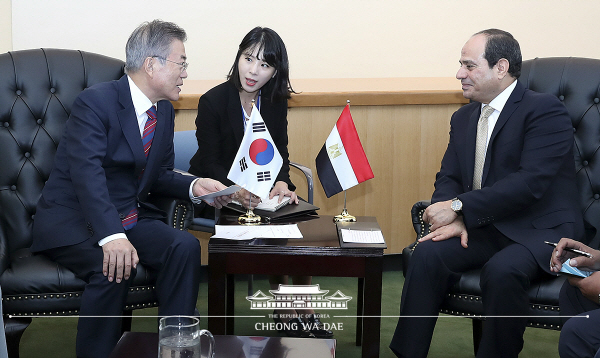 He is very active and dedicated in promoting bilateral relations between Korea and Egypt. He received many official delegations who visited Korea last year, and just returned from a visit to Egypt on 25 January, where he headed a delegation of Korean Members of the National Assembly that visited their Egyptian counterparts at the Egyptian National Assembly. Q: Who are the most prominent Korean or Koreans who made the largest contribution to the bilateral relations last year? A: H.E. President Moon Jae-in meat with Egypt’s President Abdel Fattah el-Sisi last September on the margins of the meetings of the United Nations General Assembly in New York upon his initiative. There is nothing more important in relations between nations than summit meetings among its leaders in contributing to the enhancement of bilateral relations. Beside discussing various aspects of bilateral relations between our two nations and ways to enhance them, President el-Sisi reiterated his invitation to President Moon Jae-in to visit Egypt. President Moon Jae-in accepted and welcomed the invitation, and we hope this visit takes place in the near future. Q: What are the attractive tourist destinations for your country? A: I can say with pride and confidence that no country in the world was blessed with a rich culture and history more than Egypt. Its history spans a variety of civilizations that are unique and in an unprecedented manner to have taken place in the same country. Starting with the Pharos of Egypt who impressed the human race across time with their achievements and monuments, and passing through Greek, Roman, Coptic Christian, and Islamic civilizations. Each era left its own monuments and treasures. The city of Luxor alone in southern Egypt with its Pharaonic monuments is believed to have more than 30% of all world monuments. Most recently the Vatican has approved the official map of the sites that the holy family, Jesus and Marry, visited during their journey in Egypt. The route of the holy family in Egypt is being prepared and promoted as an important destination for all interested tourists particularly Christians around the world for religious tourism. When it comes to nature, Egypt has one of the top three diving destinations in the world in the red sea, where the largest marine variety in the world exists. It has beautiful coasts along the red sea and the Mediterranean, as well as amazing safari trips in its beautiful deserts. The infrastructure for tourism in the red sea resorts rival any in the world and Egypt’s tourism industry and hotel business is developing rapidly to accommodate the rising demand for its services worldwide. The river Nile, the longest in the world, and where old Egyptian civilization came about and impressed the whole world has its own beauty, and is home to a once in a life time unforgettable experience through the cruises it offers between the two ancient cities of Aswan and Luxor in Southern Egypt. There is no limit to what Egypt can offer with regard to tourism with all its variable products; culture, beaches, safari, conferences…etc. 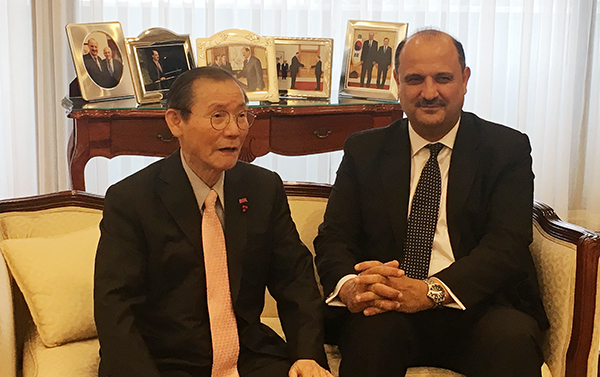 Ambassador Hazem M. Fahmy of Egypt in Seoul (right) is interviewed by Publisher-Chairman Lee Kyung-sik of The Korea Post media, publisher of 3 English and 2 Korean-language news media outlets since 1985. A: Ambassador Hazem Fahmy is married to Ambassador Amal Nosseir, and has three sons. He started his career in 1987 at the Egyptian Ministry of Foreign Affairs. He served at the Egyptian mission to the European Union in Brussels (1991-1995), at the Egyptian Foreign Minister’s Cabinet (1995-1998) and at the Egyptian Permanent Mission to the United Nations (1998-2003). He was on loan from the Egyptian Foreign Service to the United Nations Secretariat between 2003-2014. During his work at the United Nations Secretariat he worked at the Department of Economic and Social Affairs, as well as a member of the Cabinet of UN Secretary- General Kofi Annan, and as a member of the Cabinet of UN Secretary-General Ban Ki-moon. On the 1st of July 2014 Ambassador Hazem Fahmy was appointed as the first Secretary-General of the Egyptian Agency of Partnership for Development, initiated by the Egyptian President at the 23rd African Summit as the South/South Cooperation arm of the Egyptian Government with African nations. Ambassador Hazem Fahmy has a B.A. in Economics from the American University in Cairo (1986), a Masters in Public Administration from Harvard University (1990), a Masters of Philosophy in Economics from the New School University (2007) and a PHD in Economics from the New School University (2011). He is an avid reader and world traveler and likes listening to all kinds of music and enjoy swimming. Q: Who are the Korean companies actively contributing to the promotion of economic cooperation between Korea and Egypt? 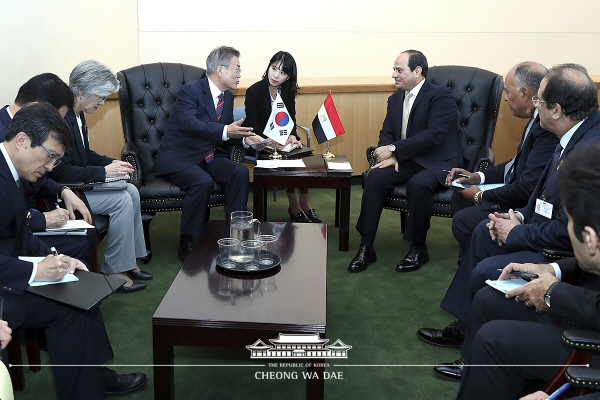 A: There are several Korean Companies working in Egypt and are actively contributing to the promotion of economic cooperation between Korea and Egypt. However, the sky is the limit of what Korean Business can do in Egypt and the future is full of unfulfilled potential in this area. Samsung Electronics has a large flat screen factory in the city of Banisweif in the South of Egypt. This factory became an economic hub in the area it was built, and besides serving the Egyptian domestic market, it is making good use of the network of free trade areas Egypt has. This factory’s exports exceeds 800 million US$ annually, and as a great partner in Egypt’s development Egypt has asked for a change in the rules of origin governing intra-trade in the Euro- Mediterranean free trade area to allow Samsung Egypt to enter the European Market. The new rule is expected to come into effect quite soon. Even though Korea has a free trade agreement with the EU, flat screens are heavy and it will be much better for Samsung to export from Egypt to the EU and economize on shipping costs. This is a classic example of a perfect partnership between Egypt and a Korean Company for the benefit of All. Also LG has a large factory at the 10th of Ramadan City in Egypt that produces flat screens and washing machines. It has a large share of the Egyptian domestic market exceeding 100 million consumers and exports to the Arab States and Africa, making use of the network of free trade agreements that Egypt has. The LG factory added new production lines since it opened and has a great potential for further expansion through exports and product diversification. GS construction is involved in the construction of one of the largest petrochemical and oil refineries in Egypt. The project is worth close to 4 Billion US$ and is scheduled to start working at the end of this year. This refinery is expected to produce half the Diesel fuel that the Egyptian economy consumes in a year. Korea Telecom is the most recent Korean company entering the Egyptian market. It partnered with an Egyptian Company Gega Global Technology and Telecom (GGTT) last year to raise the speed of the internet in Egypt. Most of Egypt’s telephone cables are made of copper wire, which is resistant to the internet. Korea Telecom developed a technology in 2014 that overcomes this resistance and could raise the speed of the internet on these wires up to 200 times. Korea Telecom conducted already field testing for this new technology in Egypt and it proved to be quite successful and will be implemented gradually starting this year. This by itself when fully implemented in Egypt could raise the Gross Domestic Product (GDP) of Egypt between 1 % and 3%. In addition to this, Korea Telecom CEO visited Egypt for the first time last year and signed an agreement with the Suez Canal Economic Zone, in partnership with GGTT to design and implement the entire smart infrastructure of the Suez Canal Economic Zone. I was informed in this regard that KT is planning to open a representative office in Egypt as an important sign of the growth potential and the deeper ties and investments it is expected to have with the Egyptian market in the near future. This is just the beginning and we expect many Korean companies to enter the Egyptian market in the near future in light of all the reasons I outlined.